I’ve been looking for the perfect recipe for Brussels Sprouts and I think I found it. The recipe is from Kalyn’s Kitchen, where I get a lot of my favorite vegetable recipes. I’m sure ideally the recipe supposes you’ll use fresh brussels sprouts, but I made this tonight with frozen. 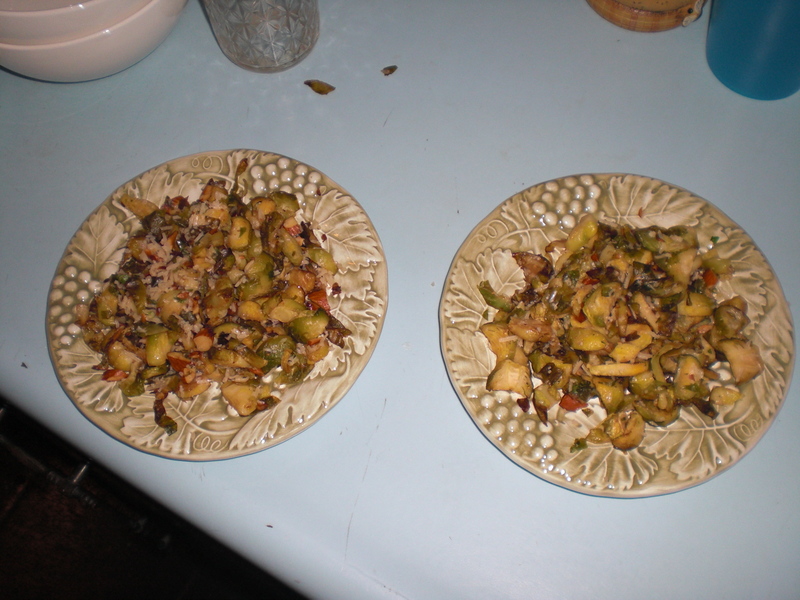 I microwaved about 20 sprouts on high for 4 minutes and then chopped them up. Preheat oven to 400F. Cut the sprouts crosswise into thin strips about 3/8 inch wide. Put shredded sprouts into a bowl. Whisk together the olive oil and balsamic vinegar, then toss the brussels sprouts with the oil-vinegar mixture and season with a generous amount of fresh ground black pepper and some salt. Arrange the brussels sprouts on a roasting pan in a single layer. Roast until the brussels sprouts are nicely browned on the edges and tender, about 25 minutes, stirring occasionally. During the last few minutes of roasting time, put almonds in a dry pan and toast 1-2 minutes, shaking the pan so they don’t burn. Don’t walk away because they go from nicely browned to burned in a few seconds. Wipe out the bowl you used to toss the raw brussels sprouts in, and when they are cooked through and browned as much as you’d like, toss the hot sprouts with the toasted almonds and coarsely grated Parmesan. Your picture looks very tasty!